The play sold out its West End run, so Wednesday's screenings are your final chance to catch this extraordinary play. Written by John Logan (Skyfall, The Aviator), the play looks at the mind and motivations of world famous abstract expressionist Mark Rothko, as he and his assistant face the threatening presence of a new generation of artists. With the production set to be screened in cinemas nationwide on Wednesday, we’re giving one lucky winner the chance to win a piece of the canvas, signed by the play’s stars Molina and Enoch, plus an official playtext. To be in with a chance of winning retweet this tweet. Entries are open until midnight on Sunday 11th November. One winner will be picked at random and contacted via direct message on 12th November. 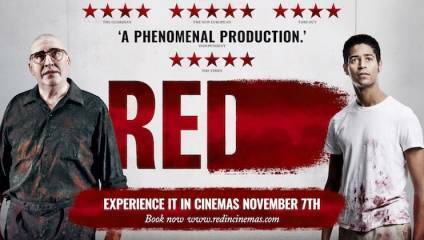 Red will be screened in cinemas on Wednesday 7th November. 2. If you are the lucky winner we will notify you via Twitter shortly after the competition end date. 5. Open to UK entrants only.